Just as I mentioned on my previous post on how life is like being a toddler's mom, I received an email from Sagarika, Madisons asking if I was open to do product reviews. Last year I was unable to be a part of some blogger events and give justice to product reviews that came into my mailbox since other priorities took up that space. However, this year began on a good note with a product review for newly launched Gone Mad – Choco Sticks that hit the market stands recently. I received a pack of 24 Gone Mad Choco Sticks in a neatly wrapped card case promising the goodness of fudgy chocolate filling beneath a layer of thin wafer. The reason I took up to this review was because this wasn't the first time I had tasted Gone Mad Choco Sticks. My previous trip to my local supermarket saw me picking up this Cigar shaped choco stick, indeed to dress up a dessert and I loved it instantly. There are several brands and kinds of Choco sticks and wafer chocolates in the market, but this is one had me smitten. I do say that it's indeed the best I have had in recent times and if I had to really describe, it's sort of a crisp bite into a thin wafer that envelops a nice chocolatey-fudgy-brownie-kinda tasting filling. And that's delicious and addictive. 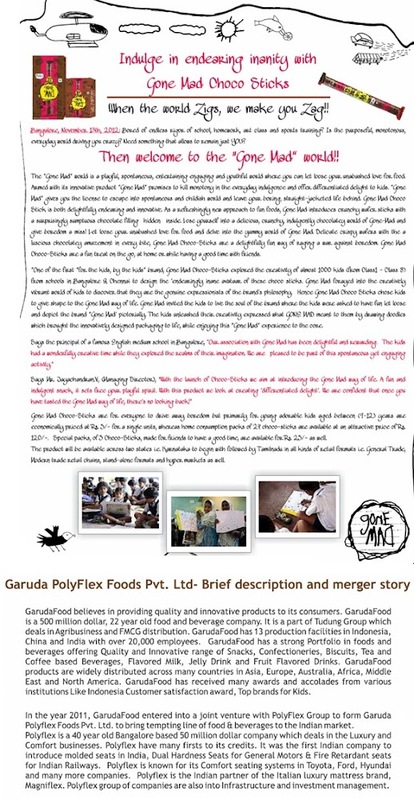 Garuda PolyFlex Foods Pvt Ltd has made a recent entrant into the wafer category with its Gone Mad Choco Sticks, and with the kind of catchy, chocolatey wrapping, a delicious piece of chocolate stick tagged at a decent price of Rs.5/- per piece it is sure to steal the show in chocolate segment of the market and make it popular especially among the kids. I handed a couple of these to my family and my friends and they surely enjoyed these bars. On a flip side, I certainly think Garuda foods may need to work a bit on their individual packaging. These Choco Sticks are great no doubt, but if you go for their singles priced at Rs. 5/-, they crumble a lot and that too quite easily. The singles are quite fragile. If you buy the package of 24 sticks then you are saved, but if you go for their singles, you'll find most of the wafers crumbling and off the chocolate filling, mainly due to human touch and feel of the product before the purchase. And I saw that as problem even with the packaged ones. Yet saying this I don't mean to demean these choco sticks. I do think the entire box of choco sticks can make up for a good picnic munching with your friends or a travel companion to beat those hunger pangs. They can be great birthday party treats or even a part of return gifts that most kids would love munching into. They can be used to dress a dessert which is quite what I did here. I made a quick Chunky Monkey Supreme Ice cream and topped it with Gone Mad Choco Sticks instead of chocolate chunks. They are delicious. There will be couple of more recipes that I intend to use these little addictive bars, but till then I do hope you enjoy these bars in this healthy, simple and delicious Quick Gone Mad Chunky Monkey Ice cream, a recreation of my Chunky Monkey Ice cream I made in the past. Place frozen bananas in your food processor. A tablespoon of honey is optional, you can add it if you like your ice cream sweet. Pulse until its mashed well and comes to consistency of ice cream. If you have difficulty while churning the frozen bananas, or if banana isn't binding, try adding 1-2 tbsp. non-dairy milk or wait for a minute or so to defrost slightly and then churn. Scoop out a ball of soft serve into a serving bowl. In a martini glass, crumble the go made choco sticks, top it with the banana ice cream and then spread generous pinches of milk masala powder, roasted and chopped nuts and garnish with more Go Mad Choco Sticks. Serve immediately. Hi M D, is it okay if I use one of your images for my post? I forgot to click pictures. I will definitely Link back and even write a separate disclaimer crediting your blog at the end of my post. Please let me know. dued it is sooooooooooo.......????????????? yyyyy!mmmmmmm!yyyyyyyyyyyyyyyyyyy!!!!!!!! from where we can buy this choco sticks bcaz i M not getting dis product from d market is there any another medium to get these chocosticks !! from where we can buy dis product ?